Schools and libraries rely immensely on internet access. Schools need reliable internet for streaming educational content, standardized testing, distance learning and 1:1 initiatives. Libraries need internet for their patrons to apply for jobs, pay bills, fill out online applications and even enjoy entertainment. Often, internet is extremely expensive to provide all these benefits. Fortunately, there is a program to help schools and libraries meet these expenses. It is called the education rate (E-Rate) program. The E-Rate program, funded through the Federal Communications Commission, provides up to $2.25 billion a year in discounts for schools and libraries. The discount applies to a wide range of internet and telecommunications services. 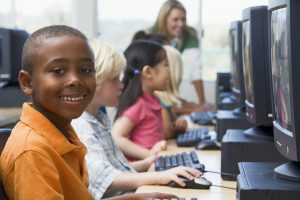 The Universal Service Administrative Company, an independent not-for-profit organization, distributes these funds and pays 20 to 90 percent of the internet connection cost of schools and libraries. USAC bases its funding decision on the amount of eligible students for the National School Lunch Program and the urban or rural location of the school or library. Eligible applicants are schools, school districts, libraries and library systems. The application for the program opens in July when schools and libraries can file a FCC form 470 request for proposal. The OneNet provisioning department sees this 470 generated in a national database called FundsforLearning and begins working. The provisioning team downloads the generated E-Rate request into Salesforce, OneNet’s customer relations management system. The automated CRM platform streamlines the job that used to be done by hand and would take hours to complete. Our provisioners are able to quickly analyze the 470 to see whether the requested services match services provided by OneNet. If there is a match or even a partial match present, then the process moves to the next step. Through Salesforce, provisioning requests quotes for intermediate circuits from last-mile providers in the school or libraries’ community. These intermediate circuits connect the client’s location to the backbone of OneNet’s network. A request for quotes is sent to all of the telecommunications providers in the community. When the best fit is found, provisioning creates a bid for the school or library. The applicant then compares the bids they receive from OneNet and other providers and chooses an internet service provider, typically, based on who produced the lowest bid. Afterward, the applicant files a FCC form 471 requesting the service and funding from USAC. A FCC form 471 includes a list of ordered services and a request for discounts on services and equipment. Once USAC reaches a funding decision, they issue a funding commitment decision letter to the applicant and the service provider. OneNet then starts right away to connect the school or library. When our provisioning team receives notice that an applicant has chosen OneNet, Salesforce is updated with the services the clients have requested. The provisioning department is the point of contact for the customer wishing to continue their service with OneNet or those wanting new services from OneNet. Provisioning issues a service order agreement for the customer to sign. Once that occurs, the provisioning department orders the intermediate circuit from the last-mile provider. OneNet’s network engineers also order any necessary equipment. The provisioning department continues to quality check the entire process, while the communications department has the pleasure of reaching out to say thank you. Once the equipment arrives and the last-mile provider has completed their work, it is time to bring the circuit online. This is where the OneNet’s Network Operations Center (NOC) comes in. This department turns up or upgrades internet service for the school or library. The NOC also performs a variety of services like managing the router and securing the firewall. Once service has started and billing begins, the customer files a FCC form 486 to indicate that they have received service. The process ends with reimbursement. OneNet makes reimbursement easy for our schools and libraries. There are two methods for reimbursement that the client can choose. Through the BEAR method, schools and libraries pay the internet provider then seek reimbursement from USAC. However, most OneNet clients choose the SPI method, which is easier for everyone. OneNet submits a request for reimbursement on behalf of the client and receives payment directly from USAC. Through this method, the schools and libraries do not have to manage billing and payment. This is the last step in the process until a new E-Rate season begins! Now, these schools and libraries can use the money saved by using the E-Rate program to better fund education, exploration and entertainment. Whatever avenue you are taking to advance your students or library-goers, OneNet is glad to provide support. For more information, please visit the E-Rate 101 on our website. Librarians – Take advantage of Internet2’s new library technology toolkit! The toolkit is helpful in preparing for E-Rate requests, planning budget cycles and opening up lines of communication between library staff and tech workers. The toolkit will guide you through a series of questions about your technology environment and provide you with all of the information you need to answer the questions. Learn more on our library toolkit page!